Today we added a new feature to allow website owners to browse all products and prices on their store including the option of overwriting selling prices on single items. The global markup (discount) option can still be used, however changing prices at the item level will supersede the global markup discount option. To access this new feature please login to your website as the store owner and go to the menu PRICING & PAYMENTS => PRICE OVERWRITE. This new admin page can be used to quickly view a list of all your products along with your wholesale cost, and the selling price and shipping cost from your site. You can also edit prices of items individually which can be useful if you wish to have a better control of pricing after you have applied a global markup. Choosing the right business is not easy for a large fraction of individuals. Multiple factors have to be considered before a person can decide on the best option. 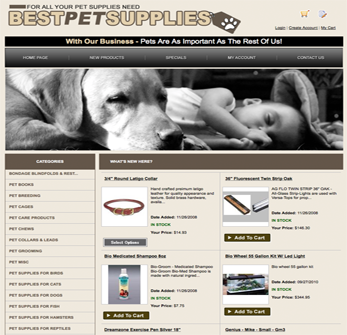 One of the most promising businesses that entrepreneurs are turning to is the pet supply business. Some major characteristics or factors that should determine a good business venture are the target clientele and revenue that it generates. According to recent statistics over 60% of the households in America alone have owned pets. Americans spend over 10 billion to purchase pet supplies annually, and the figure is rising. These percentages and numbers alone show that it is a lucrative business opportunity. Setting up an online site gives individuals a chance to easily reach consumers and wholesale2b.com makes it very easy for you to get started. With over 70,000 Pet products available for a variety of categories, you are sure to get an online pet store fully stocked with the more recent Pet supplies to hit the market. To get started, simply signup for an account at wholesale2b.com. Signing up is free meaning that you can browse through all of our products before paying for anything. No credit card is required. You can review all our dropship products using a free account. If you are satisfied with the stock of goods, you can decide to choose a dropship plan and start reselling dropship pet products on eBay, Amazon and from your own e-commerce website which we can create for you in just 1 business day. The dropship plan can be activated from your dashboard page. There are several reasons why wholesale2b.com should be your number one choice. We have a large inventory of over 1.5 Million dropship goods, which includes more than 70,000 pet related products. This guarantees that customers will get everything they need when shopping on your new pet store website. With our website plan we can setup a good website for you loaded with the best pet supply products which are supplied by reliable dropship suppliers. An added advantage is that you do not have to pay for any of the goods upfront. Purchasing the products is only necessary after your buyers have paid for their order. There is no upfront cost needed to stock the pet products. In fact you won’t even need to keep any stock because orders will be shipped directly to your customers from our integrated pet dropship suppliers. The dropship website plan guarantees a turnkey e-commerce website. You may either decide to get the domain name of your choice, or we will buy the name on your behalf. Simple choose a domain name that is available and we will buy it for you. The website will be ready to accept payments and operate efficiently in just one business day. If you want a business that offers a promising opportunity to make money the pet supply business is an ideal choice. As you know e-commerce websites can be very efficient as long as the browsing speed is fast and well organized. The search feature is also very important as many buyers won’t bother browsing categories to find an item and will go directly to the search box. In an effort to make our wholesale2b shopping cart as user friendly as possible, we added a new enhanced search feature to allow visitors to find products faster. The new “broad match” option has been added to all our current hosted websites. You will now see 2 options in the left search box on your website to allow your visitors to pick either from an Exact Match search or a Broad Match search. For example if you enter the string “Whimsical watch” in the search and choose the Exact Match option, the search will attempt to find products that have the exact words “Whimsical watch” in their item name or descriptions. If you choose the Broad Match option, the search will find any items that have either the word “Whimsical” and “Watch” in their item name or descriptions. This option will result in more search results and should provide your buyers with more flexibility in finding items on your website. Today we added 2 new enhancements to our Dropship Website Plan. As you know some suppliers such as TopDawg and CBKhome sell some of their products with a minimum quantity. We added a new validation to the shopping cart to enforce minimum quantity on such products. This new validation will only be applied on products that require a minimum order. We also added a new feature that will allow store owners to configure multiple sales tax for both USA and Canada. To access this new feature, simply login to your wholesale2b website admin dashboard and go to the menu PRICING & PAYMENTS => SALES TAX. ** Please note that the 2 enhancements above only apply to members that have our Dropship Website Plan active. ** We advise that you take time to test your site by placing a new order. Although we have made extensive tests, it is still recommend that you place a test order and report any issue to us immediately. We hope you will enjoy these new enhancements. Imagine all your friends shopping on YOUR dropship website this holiday period! With over 800,000 DROPSHIP PRODUCTS to choose from, WHOLESALE2B can help you start a successful online business selling products on eBay, Amazon or even from your own website. The best part is that with WHOLESALE2B DROPSHIP PRODUCTS you don’t have to buy them up front. You simply pay the wholesale price + shipping after you sold the product so there is very little risk involved. November is a great time to get ready for this year Holiday shopping. Now is the PERFECT time to get your own website up and running and ready to take orders for this Holiday period. Our shopping cart is included with our website plan and it includes tons of features especially designed for working with multiple dropship suppliers. With our template design tool you can create an infinite number of unique templates so no one else will have a website like yours. Click on the link below to see some samples websites that were designed by some of our members. To help you get started I will give you a 10% DISCOUNT on our Dropship eBay Plan, or our Dropship Datafeed Plan or on our Dropship Website Plan. a) Click on the link below to SIGNUP for a FREE account so you can review all our products and prices first. A “ready dropship website” is a term used for a website that is loaded with dropship products and configured with a professional shopping cart ready to take orders. This type of website should also be subject to daily updates as items come in/out of stock. New products should also be added automatically as suppliers add new products almost on a daily basis. You should also have the ability to customize the look of your website and manage your website prices, orders, discounts and more from a backend admin portal. This is essential to give you full control over your website. 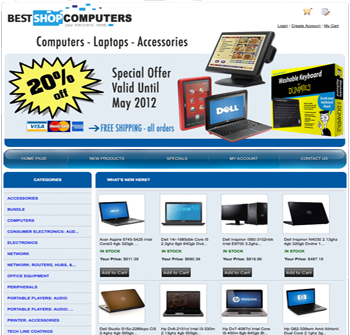 With the website plan offered by wholesale2b.com, you get all of the above and much more. We even allow you to change suppliers on the fly, directly from your admin dashboard. Simply pick your suppliers from our list and 20 minutes later your site will be refreshed with products from your chosen suppliers. No need to worry about importing product data feeds to your site, we do it all for you. Is Creating a Dropship Website That Difficult? First lets review each step required to get a dropship website up and running. The first thing you will need to do is research which type of products you wish to sell online. This is important because ideally you should choose a type of product that you are already familiar with. For example, if you have a passion for skate boards and you have some good knowledge about these products then this might be a good product line to focus on. Once you have chosen a product line, in this example we have chosen skate boards, you will need to start looking for a supplier that can provide you with good wholesale prices. Here you have the option of looking for wholesale suppliers or dropship suppliers. Wholesale suppliers can offer you lower prices however they require that you purchase in bulk. This typically requires that you have large sum of money on hand to warehouse the products therefore I strongly recommend searching for dropship suppliers instead. Prices from dropship suppliers will be higher than wholesale suppliers however you will still be able to make some profit without having to come up with a large sum of money to pre-purchase products up front. Looking for a good dropship supplier is easy as long as you know what to look for. Of course you can use any search engine to find a supplier that can supply you with skateboards however you need to apply some important criteria when doing your search. For instance you should always work with dropship suppliers that only deal with true companies and not directly with the public. This will be a good indication that the supplier is truly reserving their wholesale prices to people with a registered company only. You can also use third party services that can provide you with a list of names of suppliers that can offer you dropship services. Another criteria is choosing suppliers that are physically located in the same country where you wish to advertise your website. For example if you are located in the USA then only choose suppliers that have a physical warehouse in the USA. This is to insure that you will get fast and affordable shipping which is extremely important for your business reputation. You also want a supplier that can Blind Dropship products to your buyer. Blind Dropship means that the supplier will not reveal their name on the packing slip and they will not include any reference to your wholesale cost. This is very important because you do not want your buyers to find out the source of your products. Once you have found a supplier that can offer you the type of products you wish to sell you need to get established with a company. Most online entrepreneur opt for an LLC since it’s very affordable and easy to setup. You will require a TAX ID when applying for a reseller account with your chosen suppliers so you need to ensure that you have all your LLC license setup before applying for a new reseller account. Upon approval of your reseller account, you will need to request that the supplier send you their product data. This information should include data such as item number, item name, item description, retail price, wholesale price, category name, large and small images and the quantity in stock. Typically suppliers can provide this data via a CSV files or XML files or with an FTP access to their server. Please keep in mind that each supplier is different and may provide you with various ways of getting their data. Once you gain access to their product data you will need to download this information to your computer and import it to your shopping cart. Usually shopping carts offer an import function that can read a CSV file in a specific format. You might have to edit the file using Microsoft Excel to make changes to meet the requirements of your shopping cart import feature. Remember that items can always come in/out of stock so its important to refresh your shopping cart on a regular basis to avoid selling products that are no longer available. The next step is to build your website. I recommend that you build your website only after you have found a proper supplier that meets your product requirements because this can have an impact on the domain name you will choose for your site. At this point, in our example, we have chosen a skateboard supplier and we have successfully gained access to their product data so we are ready to proceed in creating a website dedicate to selling skateboards. Your next step will be to choose a domain name for your website. I recommend that you include the name “skateboard” in your domain name, as this will help you in getting good results with the search engines over time. For example in this case you could choose a name such as SkateboardFactory. Once you have chosen a domain name of your liking you can register it with any registrar website. Your next step will require that you look for a hosting service where you can build your website and import your product data. Typically you can get hosting services from the same place where you will purchase your domain name. Now that you have a domain name and the product data, its time to build your website which will require a shopping cart software. There are several shopping cart software available and you can find many on any search engine. Once you have installed the shopping cart of your choice on your hosting service, you will need to import the product data provided by the supplier. This will require that you take some time to understand the import feature provided with your chosen shopping cart. Once you have loaded your site with the products, you will need to choose a payment gateway in order to receive payments from your buyers. Typically shopping carts can support many types of payment gateways so it’s a simple matter of choosing which one you want and complete the proper configurations via the admin section of your shopping cart. Now you are ready to start advertising your website and take orders. In this business model, you will collect the payments from your buyers via your website and then pay your supplier the wholesale cost to ship products to your buyers on your behalf. The different between your selling price and your wholesale cost will be your profit. As you can see setting up a dropship website business can take some time. Fortunately there is a way for you to avoid all these steps and get your dropship business started in no time. Please refer to the services provided by Wholesale2b.com to get your website up and running in no time. You will be able to choose the types of products you wish to sell all from one place, without having to spend hours on end searching for dropship suppliers. You will also get a website which you can fully customize including daily inventory updates so you won’t have to worry about dealing with CSV files at all. Simply pick your suppliers from their list and your site will be loaded with all their products in 20 minutes. They can even help you process orders with the suppliers on your behalf so you can save time and money in avoiding setting up an LLC. 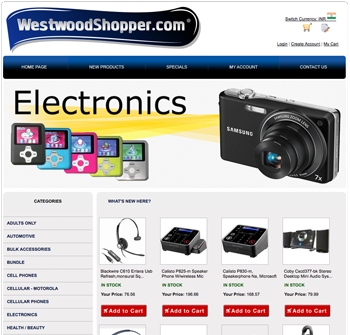 Visit wholesale2b.com for a quick way to start your e-commerce business using dropshippers. What is a dropship website? In simple terms a dropship website is a full e-commerce website pre-loaded with products supplied by dropship suppliers. These suppliers will ship the products directly to your buyers on your behalf when someone places an order on your website. This business model allows you to start selling products quickly and efficiently online without having to pre-purchase products up front. This means you can actually start a dropship business without having to invest large sums of money in warehousing tons of products. All you need is a dropship website. 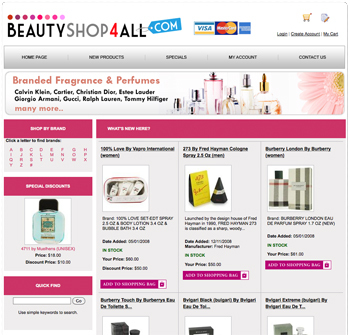 Wholesale2b can help you create a dropship website with practically any types of products you wish to sell. For example you may want to have a niche website that sells pet supplies or electronics or fragrance or any type of products you desire. The main advantage with getting a dropship website from wholesale2b is the automation. Your site will be updated daily with the most up to date inventory status of each item. This will ensure that your site is not selling out of stock or discontinued products. This is the main time consuming effort involved when you create your own website in which case you are responsible for keeping your website up to date. Getting automated daily inventory updates is a big advantage for any type of dropship business venture. To get started all you need is to choose a domain name and wholesale2b will do the rest for you. Simply choose your products from your private list of suppliers and your site will be ready in one business day. You will get a professional website along with our Admin Dashboard V2.0 from which you can customize your website in many ways. Visit our dropship sample website page to view some of our sample websites. All our sample sites were were designed using the TEMPLATE DESIGN tool that comes with the Admin Dashboard. To get started all you need is to open a free account at http://www.wholesale2b.com and activate the website plan and your website will be ready in one business day. Making our shopping cart secure is one of our main priority. To deter frauds we have decided to add a new feature to our wholesale2b checkout steps. We also added the same enhancement to our shopping cart used by all our hosted websites provided by our dropship website plan. This new security layer will record the IP address and various more information from your buyers each time they place an order on your website. This will also allow you to report to us the IP address of any fraudulent attempt to your online store in which case we can block them through our network security to protect your website. The buyer will be presented with a message displaying his IP address before confirming the order. This option was added to better protect your online store against any online frauds. This information will be recorded in the COMMENTS box from your orders detail page. To access this data simply go to your order history menu and click on the order number to access the order detail page. In this page you will find the comment box with the IP details mentioned above. Tracking codes are alphanumeric numbers provided by carriers such as Fedex, UPS, and USPS. Carriers records details about the shipping progress and make this information available on the internet which can be fetched using tracking codes. Selling marketplace websites such as eBay and Amazon do monitor how quickly sellers (you) provide tracking codes to your buyers to make sure buyers are made aware that their item has been shipped. The quicker you get the tracking code to your buyers the better. To avoid any delays, we have made a change in our e-commerce shopping cart which is included with our dropship website plan. When you receive an order to your website, you will simply need to click on the blue ORDER NOW button to process your order as usual, however you will no longer need to update your order with your tracking code when its provided. Instead of waiting for an email from wholesale2b with your tracking code and then copy/pasting it into your order detail, from now on the tracking code will automatically be added to your order as soon as we receive it from the supplier. This relieves you from having to copy/paste the tracking code into the order each time you get a shipping confirmation email. This enhancement will also avoid any delays in providing the tracking codes to your buyers as it will be immediately visible in your customer’s order history page. Please note that this feature is only applicable when you place your orders through your wholesale2b.com admin console by clicking on the “order now” button in the order history page. If you are fulfilling your orders directly with the suppliers, you will still need to manually input your tracking codes. This new feature was added to the website plan today.